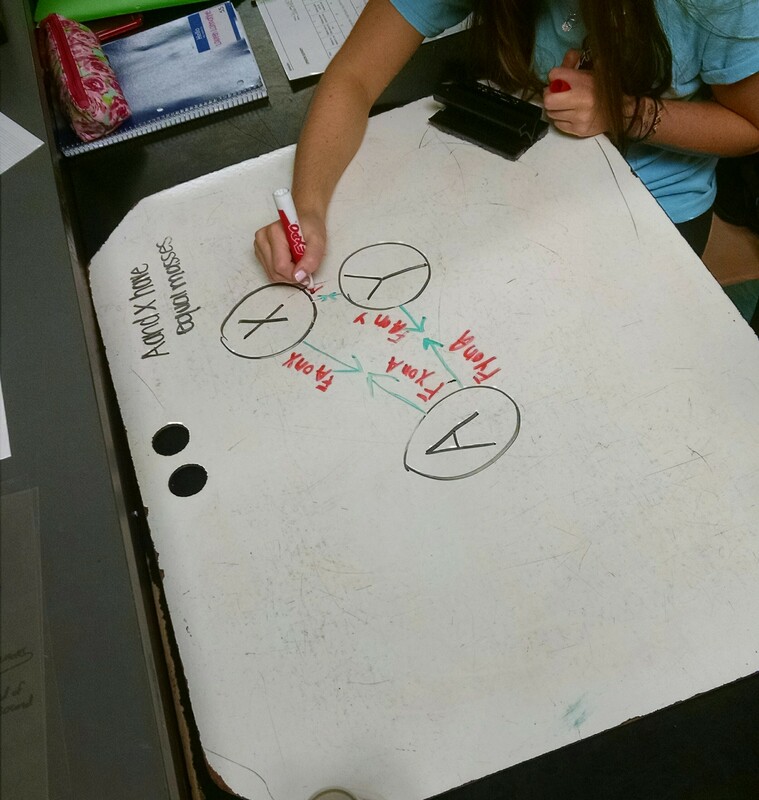 Day 28: Do Unequal Masses Pull Equally On Each Other? 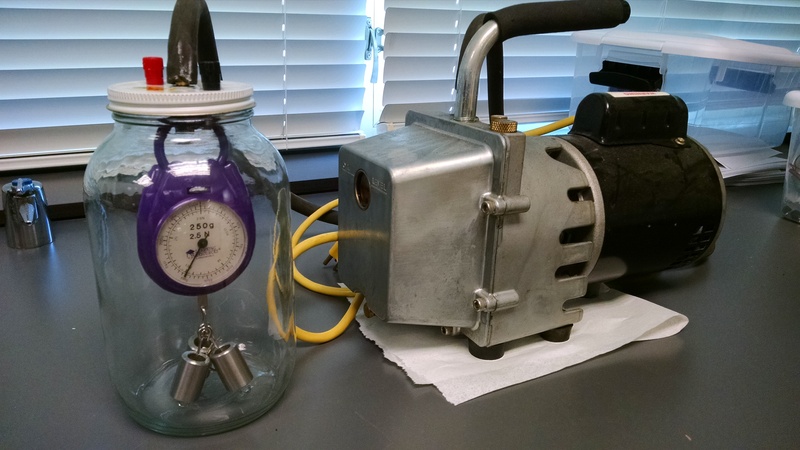 College-Prep Physics: Another round of voting, inspired by Preconceptions in Mechanics. Yesterday we determined that the Earth and tennis ball pull mutually on each other. But what about the strengths of the pulls? 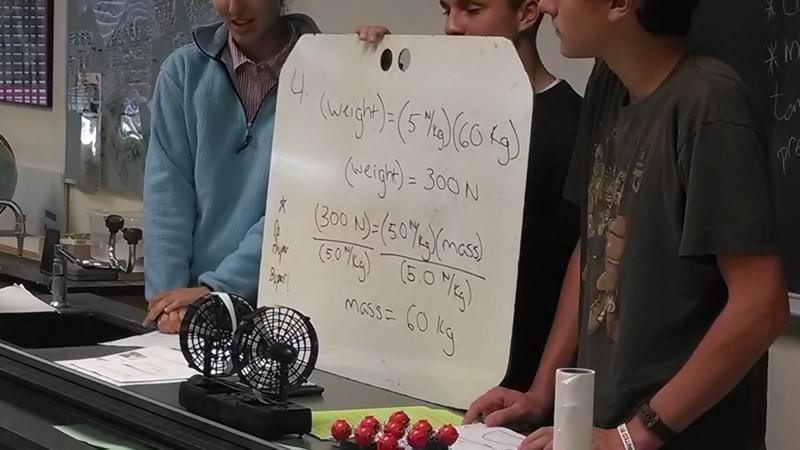 Next we used the whiteboards to draw and label the gravitational forces between tiny mass A and tiny mass X. 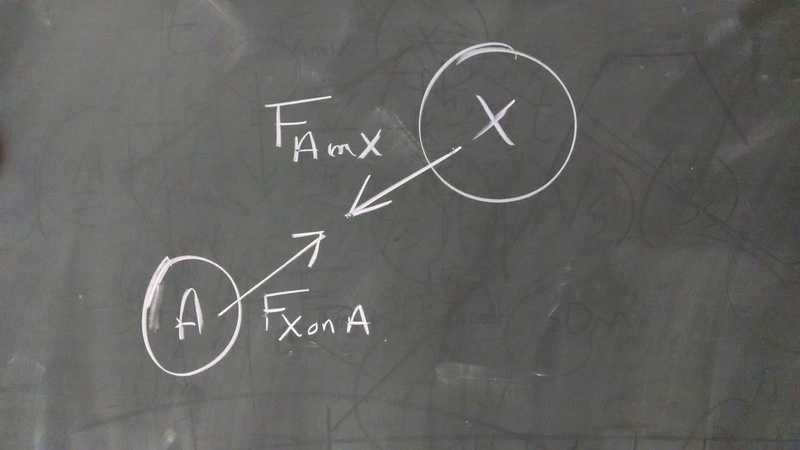 A surprise to me: most groups were not able to properly label the forces as F(A on X) and F(X on A) — they had the labels reversed. So it was important for me to go to each group and coach them for proper arrow labels and placement (arrows attached to objects, not hanging in mid-air). How many pulls on A? How many pulls on X? Then we added attached another tiny mass Y to tiny mass X. Does that change the interaction between A and X? [No.] Do we need to add more forces? [Yes.] Draw them. How many pulls on A? How many pulls on XY? Then we added tiny mass Z to mass XY. Do the existing arrows change? Do we have to add more arrows? 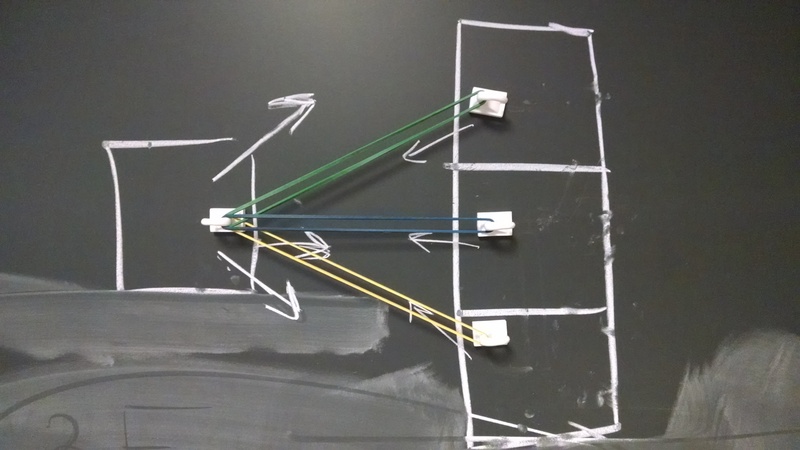 I also modeled the situation on the blackboard using magnetic hooks as the masses and rubber bands to represent the gravitational forces between the masses. Great lesson in all, though it took a lot of time because I wanted the kids to reach the conclusion on their own rather than me just telling them. I hope it sticks! Day 27: Is Gravity a Mutual Force? Then we moved to the bridging scenario, where we have the Moon (less massive than Earth 2, but more massive than a tennis ball): “Does the Moon exert a gravitational pull on the Earth?” We shared our thoughts again, several students mentioned tides as evidence, and we came to consensus. What if we make the mass of the moon smaller and smaller, until it was the same as the mass of a tennis ball? We moved back to the target scenario and re-voted. 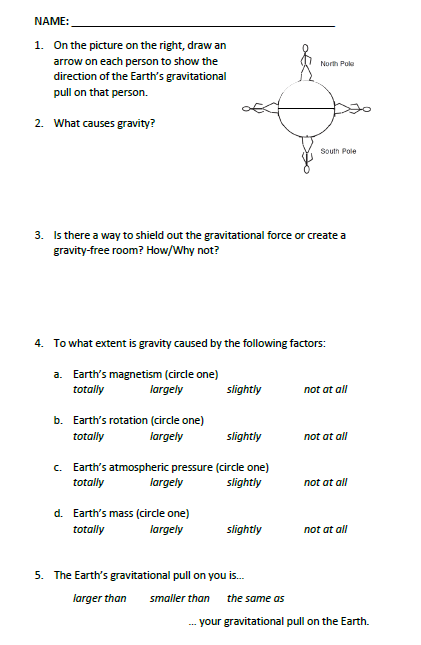 Lastly, I asked the students to discuss whether gravity was a one-way or two-way (mutual) force, based on our discussion. I should note that we have not discussed Newton’s Third Law yet. Tomorrow we’ll discuss if the mutual gravitational pulls between unequal masses are equal or unequal in size. Then we went through each of the four claims in survey question 4 and did a testing experiment for each claim. We also compared characteristics of different planets using a table of planetary data. This sequence of claims and questioning is based off one found in Preconceptions in Mechanics. On Tuesday, we’ll discuss the relative strengths of the gravitational pulls that 2 masses exert on each other. Most people say the astronauts floating around on the International Space Station are weightless. Why is “weightless” a misnomer in this case? What’s really going on? This wasn’t the first time we discussed this. We talked about how the astronauts are really falling around the earth because of their large tangential velocity and then we related that to making the bowling ball move in a circle by hitting it with a mallet. Students even asked if that meant astronauts feel that falling sensation in their stomachs all the time. So what happened? Why the struggle just a few days later? Many students fell victim to what I call the “mashup” theory of learning: At first they thought there was zero-gravity on the ISS, but then in class we discussed that there was gravity. So the mashup of the 2 concepts is that there’s just much less gravity at the ISS, so the astronauts can still float. And all that falling around the earth stuff? Forgotten. 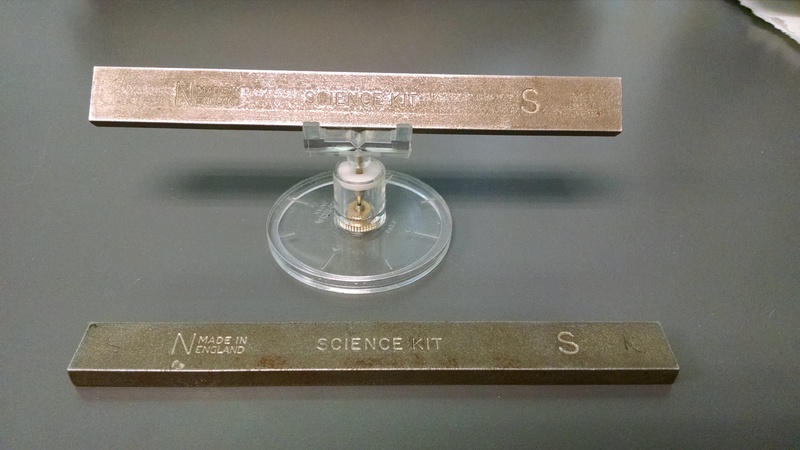 So I tried to demonstrate that “weightlessness” ≠ “no gravity” by dropping a mass hanging from a spring scale. I asked them to predict what would happen to the reading on the scale. Answers were all over the place. We filmed the drop using the slo-motion setting on my phone’s camera (a Motorola Moto X). We we played the video, we saw that the scale read zero (weightless, according to the scale) but clearly there was still gravity (that’s what made it fall in the first place). Same thing with the astronauts, but they are going forward fast enough that they never hit the ground. 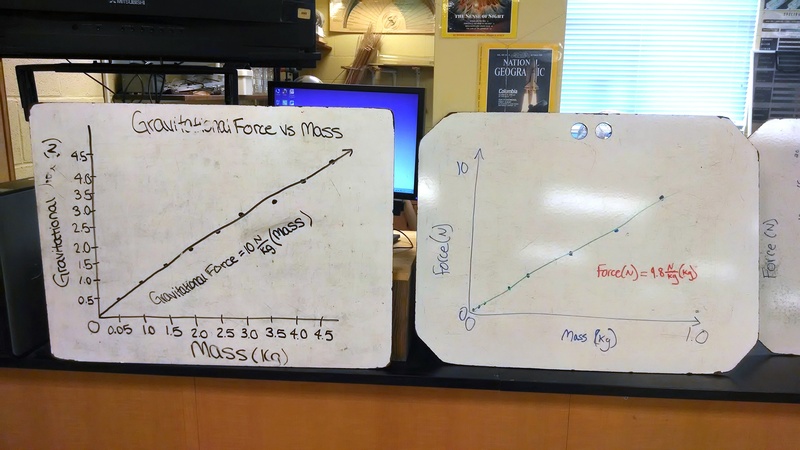 College-Prep Physics: Today we debriefed the gravitational force lab where students found the relationship between mass and weight. Why does everyone have similar slopes? Should they? What does the intercept mean? How would the graph change if we repeated the experiment on the Moon? On Jupiter? Now we’ve established that all objects pull on all other objects. So does a tennis ball pull on the Earth? But how does the tennis ball’s pull compare to the Earth’s pull? Then I had 2 students stand on one side of the room to represent the less massive tennis ball and 3 students stand on the other side to represent the more massive earth. Each student represented a “particle” of equal size and mass, but one side had 2 particles (tennis ball) and the other side had 3 (earth). So how does the pull between any two particles compare? And every particle pulls on every other particle, right? So then I ran strings connecting each student to each other student. Then we counted up the strings. 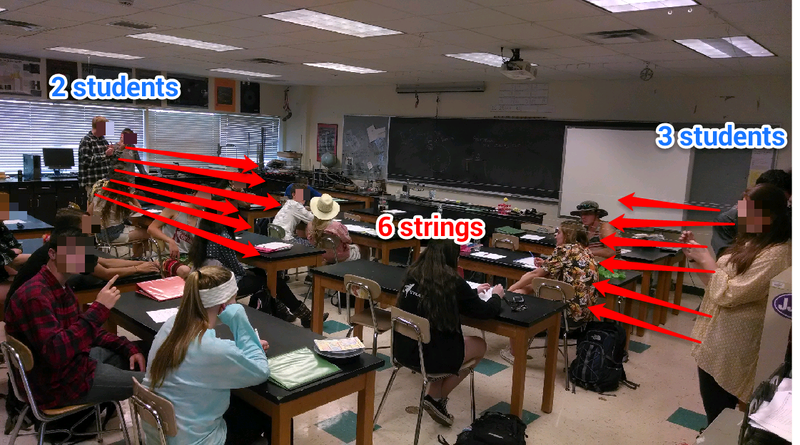 6 strings pulling on the 2 particle object (tennis ball) and 6 strings pulling on the 3 particle object (earth). THE FORCES ARE THE SAME! Ah, but the effects of the forces have on the objects are different. The earth feels 6 forces on 3 particles (or 2 forces/particle) while the tennis ball feels 6 forces on 2 particles (or 3 forces/particle). Or think about it in terms of a tug of war between the two student teams: Both feel the same force, but the 3 person team is harder to move than the 2 person team for the same force. This correctly matched students intuition that the Earth would move less than the tennis ball. Again, thanks to Preconceptions in Mechanics. 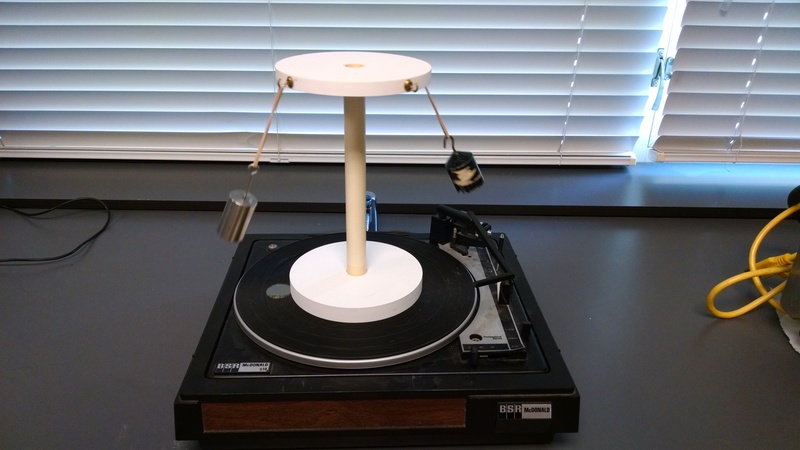 I just made the demo more grandiose by using students and string instead of nails and rubber bands. PS: In another class I was running low on time and I didn’t use string. Instead I had the students point at each other with hands and feet. Again, 6 forces = 6 forces. Worked just as well, IMO.